The concept of original sin refers generally to the Christian belief in the universal nature of sin. 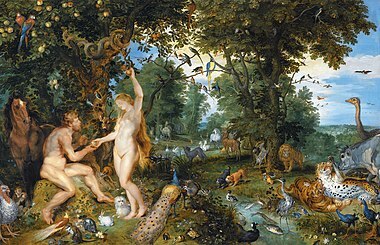 Original sin is considered to be the result of the story of Adam and Eve in The Bible. In that story (Genesis 3), God only made one rule for them: They must not eat fruit from the tree of knowledge of good and evil. But the snake told Eve, that eating the fruit would make Eve like God. Eve then persuaded Adam to eat the fruit. After they had broken God's only rule, they were removed from the Garden of Eden. Then Genesis tells the story of how their oldest son Cain killed his brother Abel. Based mostly on this and many other stories and passages in the Bible and Saint Paul's statement in Romans 5:12 (Sin entered the world because one man, Adam, sinned, and death came because of sin. Everyone sinned, so death came to all people.--NIV), Christians traditionally believe that no human is without sin. More specifically the term "original sin" refers to the state of being part of the human race. This was first explained fully by Saint Augustine in his writings against the Pelagians. The Eastern Orthodox Churches do not believe in this specific doctrine of Original Sin. This page was last changed on 23 April 2018, at 04:51.